The Guardian: Modern Arabic literature achieved international recognition when Mahfouz was awarded the Nobel prize in 1988, and it is difficult to think of any prizewinner whose status as a writer was so dramatically changed as was that of Mahfouz by the award. Installed at his regular table at his regular café in Cairo, Egypt, a daily rendezvous that only illness could cancel, Naguib Mahfouz observed the anonymous crowd swarming the city streets with an eye that was tolerant, humane, sometimes ironic or arch, but never malicious…. …From a Western perspective, it is difficult, I imagine, to understand the cultural power these novels exerted. 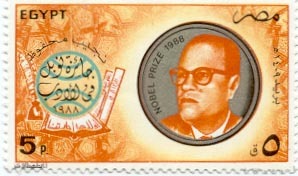 Even before Mahfouz won the Nobel Prize in 1988, the trilogy had the effect of liberating a generation of Arab writers. Young writers like Haydar Haydar and Fadhil al-Azzawi didn’t write like Mahfouz, but his books and his stature gave them the confidence to persevere in examining everyday life. Mahfouz opposed the fatwa as essentially un-Islamic and stated clearly his defense of freedom of expression. But in 1992 he appeared to shift his position slightly, saying that, while the fatwa was intolerable, Rushdie’s novel was “insulting” to Islam. Why Mahfouz, who in 1959 produced a novel (Children of Gebelawi) that portrays God, Adam, Moses, Jesus and Muhammad as mere mortals, should have found The Satanic Verses to be offensive is a bit of a mystery. In any case, Islamic fundamentalists, bent on waging a culture war, turned against Mahfouz, precisely because of Children of Gebelawi. In 1994 he was stabbed in the neck and as a result of his injury he was unable to hold a pen or a pencil in his writing hand. Our conversation in the coffee house turned to Rabindranath Tagore. Everybody in the Indian Mission had told me about Mahfouz’s fondness for Tagore. I had framed many questions in my mind before I met him. Like which work of Tagore did he like best? Did he read Tagore in Arabic translations or in English? When did he last read a major work of Tagore? “I read Tagore every morning, like a prayer,” Naguib Mahfouz interrupted me. After that I knew no more questions needed to be asked except, perhaps, what so fascinated him about Tagore. He clinched that in a short sentence: Mahfouz liked Tagore because Tagore was the soul of the world. Tagore lived in the cosmos, Mahfouz emphasised, and was its very soul. The Complete Review has several of his books under review–as you can see, the quality of his work varied very widely, from the acclaimed Cairo Trilogy to stodgier, more exasperatingly allegorical works.